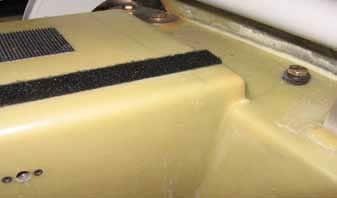 Composite Floor Repair | Tennessee Aircraft Services, Inc. If you’ve been reading my articles for very long, you’ve probably picked up on the fact that my knowledge base is in aluminum structural repair. There’s a certain comfort in being able to get a thumbnail view of the quality of a repair just by looking at it. One can measure the material thickness, count the number of fasteners, and easily calculate if the repair is as it should be right on the spot. Composite repair requires a much different mind set. The bucking bars, rivet guns, metal breaks, English Wheels, mallets, and drills of sheet metal is replaced by mixing cups, brushes, heaters, hot bonders and scissors. Composite work has held a certain level of dark mystery for me, until recently.In my sheet metal world, I am able to use the aircraft service manual, the manufacturers structural repair manual, or FAA AC 43.13- 1B to determine a particular structural repair scheme. In extreme situations I can engage an FAA Designated Engineering Representative (DER) or even hire the engineering department at Cessna to design a repair. Unfortunately, so far there aren’t any composite repair schemes in the Corvalis service manual and a structural repair manual doesn’t exist yet. A composite DER could be used but he/she doesn’t have access to the individual aircraft’s repair maps that Cessna maintains. There are limitations on where and how many repairs can be made to various areas of the Corvalis. Cessna records all repairs to these planes to ensure any new repair does not conflict with any old ones. One might think all new planes are void of any factory repairs, but one would be incorrect. Accidents even happen at the factory and repairs are made. Since Cessna engineering holds the only complete map of the plane, then they must be consulted at some point. The process begins with the shop generating a Structural Damage Report Form which includes details of the damage, including photos, for the engineers to use. They determine what repair is appropriate and ensure that it doesn’t conflict with any previous repairs. Some repair definitions may be complex and require a significant amount of time to complete. Others, like our aft floor repair, are a known item so the repair definition is already determined and may be returned the same day. A major change occurred after the problems at the Cessna composite factory in Mexico initiated an FAA Airworthiness Directive that grounded all the newest Corvalis airplanes and parts manufactured at that facility. The short version of the story is the composite layups were contaminated with too much moisture. As a result, amendments were added to repair definitions that include substantial environmental restrictions. The original Columbia factory in Bend, Oregon, probably had little difficulty keeping humidity below 40% and temps between 65 and 80 degrees. Life is a bit different in Jackson, Tennessee. We’ve made four of these repairs in the last four weeks with temperatures typically in the upper 90s and humidity in the upper 90% range at the same time. Getting an 8000 square foot hangar space to the required environment is just not a financially viable option. Building a plastic tent just large enough to enclose the repair and the working space is a more logical solution. I rate the difficulty of my home repair jobs by how many trips to the home improvement store are expected. At this point I’m thinking just one trip for tent materials and a dehumidifier and we’re all set. 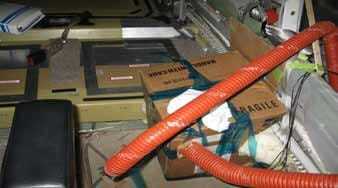 We already had a small 5000 BTU window air conditioner for use when working inside closed off cabins. What else could we possibly need? It all seemed so simple at first. 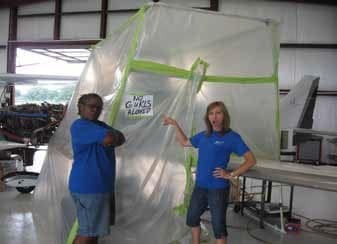 We created a plastic tent with a PVC frame that would attach to the open pilot’s door frame and extend out along the leading edge of the left wing. The tent was sealed all the way around with tape and a door was fashioned that would seal as well. A 5000 BTU window air conditioner and a single dehumidifier set in place to generate the proper environment. A temperature and humidity recording device was placed near the repair area to monitor the progress. After 24 hours the best we could get was about 82 degrees and 45% humidity. Back to the home improvement store. The “he man women haterz klub.” Be afraid, be very afraid. We added a 10,000 BTU window air conditioner and a second dehumidifier and started the process again. Twenty four hours later and we either had the humidity in range or the temperature, but not both. A close inspection of the tent revealed a few gaps which were repaired but still no joy on the humidity. Another trip to the store for a third dehumidifier. We also found a way to connect drain hoses to the dehumidifiers so we didn’t have to worry with emptying their water buckets every few hours. We reduced the size of the “tent” several times to lessen the volume of space to be controlled until it had the feel of a Little Rascals’ club house. Another 24 hour test including our typical afternoon thunderstorms followed by just as typical sauna like humidity yielded success. I missed the store trip estimate a bit but then, who’s counting? The Cessna repair definition also requires the repair area be in the limited environment long enough for it to acclimate. Unfortunately, they don’t give any suggested length of time for this acclimation. We randomly decided 24 hours should do the trick. Finally, we can actually begin the repair. 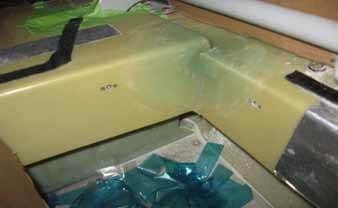 Since we are practically limited to using the Cessna repair definition as our FAA approved repair data, we are also limited to using the materials it calls for. Several newer and possibly better resin systems have been developed since the Columbia/Corvalis was certified. Use of any of these “better” systems would require a great deal of testing and certification work with the FAA that Cessna is not in a position to do at the moment. View of the floor cut out just behind the pilot’s door looking aft on a 400. Closer view of the floor. Note the lighter colored area at the top corners on this 400. The damaged material is removed and the area is blended in a manner vaguely similar to blending a nick in a propeller. Each of the six layers of cloth are exposed in 1/2” widths so the repair has proper bonding surface area. The repair definition determines the size of each layer and its weave orientation. The orientation must be the same as the original construction to create the same strength. Just like in metal repairs, we want to match the strength and rigidity of the original structure so as not to create stress points. In this particular case I found it interesting that the damage is likely caused by a deficiency in the production process or an area of structural deficiency, but the repair definition does not address this. The repair only returns the damaged area to its original strength. We’ll see if time shows something more robust might have been performed. The pre and post cure processes are not speedy events. The resin is mixed and then must sit for at least an hour. 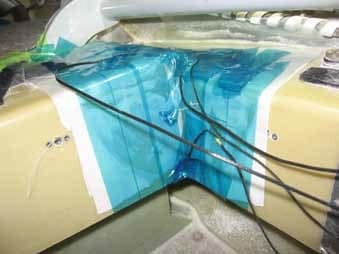 After that, there are three hours of pot life to get the fiberglass cloth whetted, cut to fit, and applied to the repair area. A peel ply material is applied over the glass repair to help hold down the layers and bleed of extra resin. This peel ply material is removed later and is not part of the repair. The repair is allowed to “pre-cure” for at least six hours until it is hard to the touch. The “post cure” requires the repair to be heated from ambient temperature to the full curing temperature of 220 (+-10) degrees Fahrenheit at an even rate over a period of 240 minutes. The repair must then be held at the 220 degrees for a minimum of 120 minutes then cooled down to 170 degrees at a rate of 10 degrees per minute. This heating process is often performed by applying special heating pads that are controlled by a device called a hot bonder. Heating pads don’t conform very well to the compounded corners so another very high tech method is employed. We build an oven with a cardboard box and blow hot air in with a heat gun. 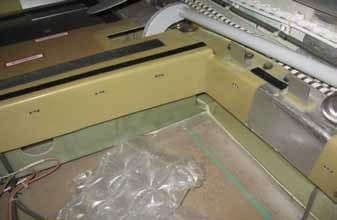 The heating element of the heat guns are wired to the hot bonder for precise control. Thermocouples are attached to the repair for temperature reference by the hot bonder. After the post cure is complete the club house can be disassembled. The oven, thermocouples, and peel ply all get removed and the repair inspected. The repair is inspected for any voids or excessive air bubbles in the cloth plies. 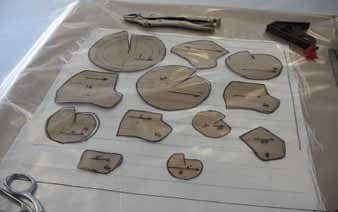 A light sanding may be done to remove any edges. Be careful for any stray glass threads though. Once hardened these threads are like invisible needles and they just love to stick into the skin. When trying to remove these glass thorns the operative word is invisible and you may just live with this thorn for days, or longer. All is cleaned up and inspected with no anomalies found so the job must be done: “but wait, there’s more”. During the repair we placed a 1 fluid ounce container of the mixed resin and a 1 inch square repair sample to be sent to Cessna labs for testing. Several tests are made to these samples and the ultimate determination of the composite integrity is then reported. It’s not out of the realm of possibilities that the repair would be rejected after the lab results are returned. That would definitely muck up one’s entire day. Being a relative newcomer to composite repairs, I only know the current repair methods which include the climate controls. For years these repairs have been performed with little control or documentation of the environment during the repair event. I understand Cessna’s current position after the AD and their desire to limit risk. During my first of these repairs, I contacted Cessna engineering several times to see what leeway they might allow for the humidity, but none was offered. I wondered if all this is so critical then what should be done about all those previous repairs? Will they debond over time? Will some unique AD be drafted that applies to composite repairs that can’t substantiate the environment at the time the work was performed? These are all pretty unlikely scenarios, and to my knowledge none of the older repairs have failed to date. As risk averse as Cessna and the FAA are, I have great confidence that if there were any real concerns for the integrity of these older repairs, we’d be notified in some fashion. The FAA would create an Airworthiness Directive at worst or a Special Airworthiness Information Bulletin at least. Cessna would have produced a Service Bulletin at worst or a Service Letter at least. Since neither has been done or rumored, I’d say there’s no reason for concern. No worries but interesting thoughts none the less.